First, to state the obvious: Clifford Odets’ mid-period play, “The Big Knife,” best known today as a TCM staple in its 1955 film version with Jack Palance and Ida Lupino is simply not in the same league as “Awake and Sing” or “Golden Boy,” both revived so superbly by Lincoln Center Theater. Odets had, by the late 1940s, toiled for several long years in Hollywood, and like many great writers had allowed himself to “sell out” to Tinseltown. By 1949, he decided to make the studio system the target of his latest play, while reworking familiar themes about money corrupting and losing one’s ideals. So here we have Charlie Castle, popular movie star, who once trod the rarefied Broadway stage, on the cusp of a 14-year studio contract renewal (those were the days!). But his wife Marion (Marin Ireland) has seen how fame and money have sullied him, and now will leave him if he renews. Charlie himself is full of self-loathing, and is very much on the fence. But the studio – represented here by studio boss Marcus Huff (Richard Kind) and aide Smiley Coy (Reg Rogers) – are covering up a scandal in Charlie’s past. They’ve kept it under wraps till now, but will expose their money-making star if he doesn’t sign. The first two acts are performed without a break, and they are, on the whole, rather sluggish. The writing would seem to be the culprit, but I can’t say for certain. Still, there’s more than enough melodrama in the second act to make up for any deficiency in the first. The always dynamic Bobby Cannavale seems a bit too one-note here and doesn’t fully convey the nuances of his inner conflict. 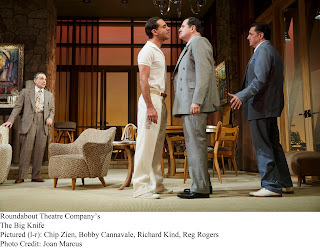 In his review of the original production, Brooks Atkinson of the New York Times thought that star John Garfield gave “an interestingly moody performance”; but that doesn’t quite describe Cannavale despite the actor’s innate charisma. The supporting players are solid: besides those mentioned, there’s Chip Zien as his loyal agent; Joey Slotnik as the friend he exploits on many levels; Ana Reeder as the man’s hot-to-trot wife; C.J. Wilson as a writer friend; and Rachel Brosnahan as star-struck girl who causes big trouble. 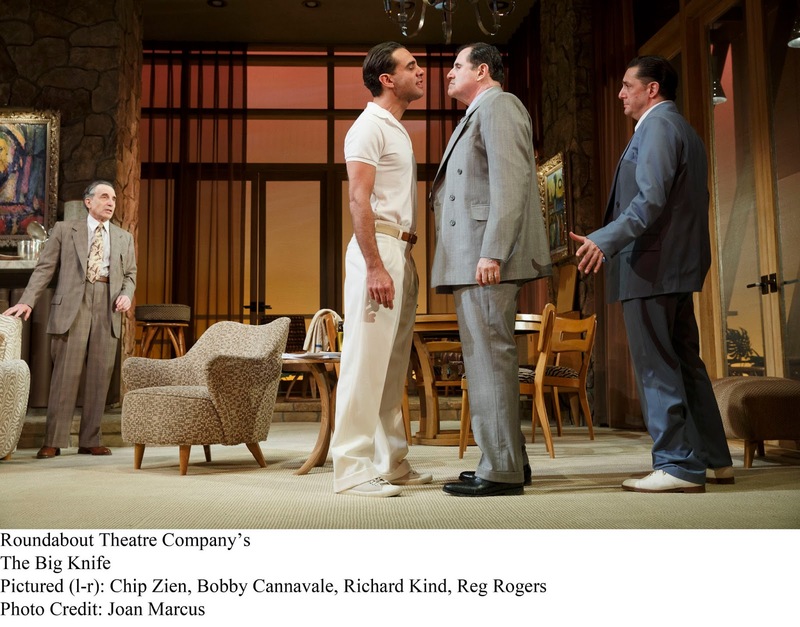 Atkinson also praised the “spontaneity and tension” which original director Lee Strasberg created back then. Those qualities are rather what seem missing from the estimable Doug Hughes’ otherwise intelligent staging. Still, in spite of flaws, it’s a treat to see a famous title like this, written by one of theater’s latterly unsung heroes, in such a deluxe production, that adjective underscored by John Lee Beatty’s swank living room set, and Catherine Zuber’s sharp costumes.